It’s rare to find a porter below 5% ABV these days. Though it’s also rare to find a traditional, to-spec porter for that matter. Greenport Harbor Black Duck Porter is a pretty standard, no frills porter at only 4.7%. That’s actually not an easy brew to make so I’m impressed even though the beer is just plain good. I poured a 12oz bottle into a flared snifter. There was no freshness date and it cost $3.05 ($0.25 per ounce). Appearance: Dark brown body with light brown highlights. Pours to a two-finger, tan, foamy head which retains pretty well but doesn’t leave a lot of lacing. Smell: A lightly sweet malty aroma with a hint of milk chocolate and roasted malt. Not too intense, but nice. 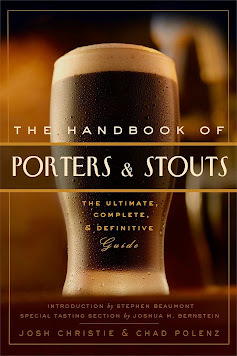 Taste: When I think of a no frills porter, this is exactly what comes to mind. That’s not to say this beer doesn’t taste good – it does – just that it opts for normalcy over distinctiveness. It’s quite sweet right from the get-go: some dark malty flavors akin to that of a brown ale. Minor notes of toffee and milk chocolate up front with some dry roasty bitterness on the finish. I also detect a slight tanginess, which isn’t uncommon. I’m not sure if that’s intentional or if this bottle is a little old. I will say all the flavors are in the right place in the right amount here, so this is an enjoyable brew even if it doesn’t knock my socks off. Drinkability: Greenport Harbor Black Duck Porter also has the mouthfeel I associate with a traditional porter. It’s not exactly velvety, though it’s certainly soft and smooth with low carbonation (not crisp at all). Nor is it sticky or cloying. That’s not surprising considering the beer is only 4.7% ABV. It does have quite a lot of flavor for such a light body. Might not be a bad beer to session in the colder months.